It was back in 1990 when my wife and I started our adventure with discus fish. Because it was almost impossible to get this type of fish on the Polish market, we started to import discus fish from Asia to enrich our collection. Currently, we keep in touch with international judges, we keep track of breeding lines, and also we actively participate in many competitions. 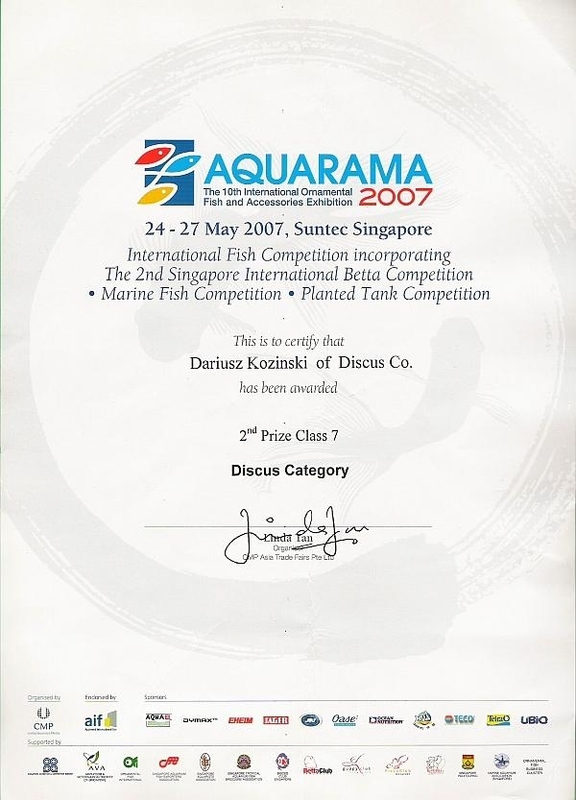 I would like to mention the second place prize in snakeskin category in Singapore Aquarium 2007, as a first company from Poland. What is more, we are always pleased to offer you fish that come from specialized breeders with long-lasting traditions. We are not seling fish that come from random breeders, who sell discus fish with many other species. As a result, my wife and I are offering you discus fish with the highest standards for healthiness, and clear prins of genetic breeding lines. Fish that take care of, are under competent observation. Best care is based on long experience that I've had for years, and also my profession as an animal science specialist with. Species in our breeding do not suffer from any illnesses, which makes our customers be more satisfied with our company every year. We invite our friends, and discus fish' lovers to collaborate with us, and benefit from variety of our offert abd knowledge in discus fish breeding. We also offer you special care in aquarium treatment, and all the set-up required for starting own collection of discus fish.